Yes, I disappeared for a bit, sorry ’bout that, but I’ve been busy making a ton of cash. Twice a year, I have a resale in my home. At the beginning of spring and end of summer, and I’m currently in the final days of my fall/winter sale. Opening up your home to sell children’s clothes and gear is a bit time consuming, but once again I’m motivated by the ton of cash I’ve made. I’ve been doing this for a couple years, and have quite a few regulars that come to my home and spend big money. They of course, are motivated by clean, well cared for clothes, and of course the price. I sell most items for $1.00. 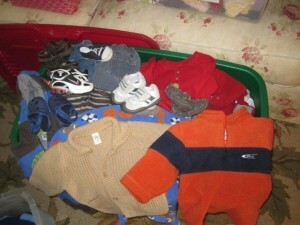 Shoes, Gap, Gymboree and Polo shirts, Levi’s jeans, all $1.00 each. Now I know I could sell most of these items for more than a $1.00, but I don’t think I would sell as much. I guess I figure that between the clothes that I’ve purchased new, the ones I get from garage sales, and the ones that are given to me, $1.00 is a great price. I advertise on www.Craigslist.org and www.napervilleyardsales.com, so most people that contact me are local. Of course I’m always concerned about having people in my home, so I’ve implemented a few rules. You must call me before I will pass along my home address. You must pay in cash. I’m never at home alone when someone comes to look. Trust your gut – if something doesn’t feel right, pass on it. Number 2 & 3 are usually easy to get others to comply with, but it’s funny how many people just don’t understand why I make them call me for my address. I’ve had people demand that I send them my address via e-mail, and others that just won’t call me at all. I even had one women that refused to call initially, then when she finally broke down, she blocked her phone number, so I advised her that I wasn’t willing to pass along my address without some type of phone number for her. Although she begged and apologized, my gut just told me to let her go. In case you don’t understand my request, it’s because I feel a tiny bit safer having a contact number for the person coming to my home. You never know what might happen, but if something does, I have an e-mail address, and phone number to help figure out who the person is. 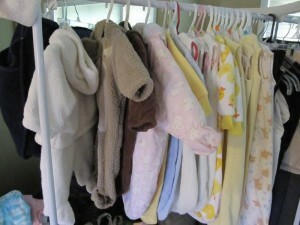 And yes, I know that people can set up a fake e-mail address, and buy throw-away phones, but I’m selling children’s clothes and gear, not plasma TV’s, so I think I’m safe for the most part. Bins or somewhere to display your clothes in an organized manner. I advertise the fact that I have organized bins of clothes; come dig through them. I separate boys from girls, and sizes to make it very easy to find what you are looking for. Open a free account to craigslist, napervilleyardsale, and any local online news website, like triblocal and your local Patch: NapervillePatch, LislePatch. You can advertise this type of sale for free. Take pictures of large ticket items, usually gear. People are more likely to contact you if they can see some images. Time – yes, it is very time consuming to field questions you get via e-mail, and it is your responsibility to answer all the e-mail within a reasonable amount of time… no more than 24 hours is ideal! Minimal amount of cash because someone is going to show up with a $20, for a $4.00 purchase. Patience… yes, you will need a ton of this. Just know that the people that consume a ton of your time initially via e-mail, will be the ones that bring you a $20, and spend $4.00. It doesn’t happen often, but I’ve had to let some potential sales go because I’m just not willing to spend hour after hour answering questions about a $1.00 item, especially when they don’t show up when they say they will, or for someone that is only going to buy $4.00 worth of clothes. Business is business and my time and yours is worth more than $4.00 and hour. Make sure your clothes and gear are clean, especially if you say they are. That means NO STAINS! I’m amazed to find clothes that are covered in stains, or have been stored in a dirty bins with cobwebs, or have crusty food stuck to them. Seriously, no one wants to buy clothes that you haven’t washed or have a stain on the front! Save a few grocery bags so your guests have something to carry their purchases in. When my sales end, I still have some items left, most I pack up and stick in the attic for the next sale, but I still donate and give some away too. It not too late for a fall/winter sale, or mark your calendars now for March/April next year. Give yourself at least a week to get your bins organized, pin or tape 2 piece sets so they stay together, and then post your sale and start checking your e-mail for interested buyers. You may even make enough money to buy most of your Christmas or upcoming holiday gifts. Previous post: Here’s the Secret to Loosing that Baby Fat! 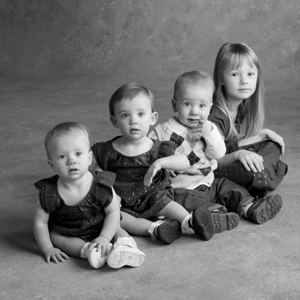 Next post: Triplets turn 2…. Terrible 2′s x 3?